Sydney Plumbing Services » Inventor rolls out 100 years. 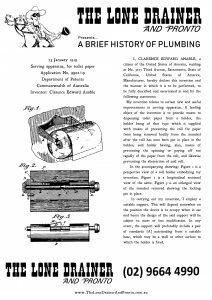 It shouldn’t pass without notice that January 23rd 2019 is the centenary of application No.9902/19 with the Commonwealth of Australia’s patent office of the “serving apparatus for toilet paper” also known as the toilet paper roll holder. The invention dispenses a product most of us use daily. Whether your favourite toilet roll is textured or patterned, two or four-ply, premium or pulped, waxed or lotioned, the standard sized roll or the jumbo or jumbo junior, whether you roll over or under, please take a moment to contemplate the genius of Clarence Edward Anable of Sacramento California. Mr Anable’s revolutionary invention has, without doubt, improved the sanitary status of the world.